Sometime in June this year, a friend alerted me to Alex Au’s commentary on a book launch he had attended in Malaysia. 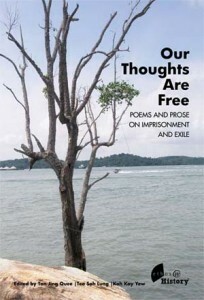 The book in question was a poetry collection, Our Thoughts Are Free, composed by a group of former political prisoners who had been held under the ISA at various points in Singapore’s history. In his essay, Alex described the disconnect he felt between the authors of this poetry collection and himself. So profound was this disconnect that Alex started by writing about the absence of any “political significance” of this event and ended by reaffirming the irrelevance of these political detainees (and what they’ve got to say) to “Singaporeans living in modern Singapore”. Alex made what I saw were two important and valid points. First, he wrote that still “enamoured with a bygone Malaya”, the authors failed to position themselves as Singaporeans and address the concerns of contemporary Singaporeans. Conceding that their emphasis on “a bygone Malaya” might be an attempt to appeal to a Malaysian crowd, Alex was nonetheless unable to appreciate that for the detainees “Malaya was not some abstract political concept but a social reality, and one aspect of (their) common Malayan heritage is internment without trial.” To him and the majority of Singaporeans, Malaya is now only an “archaic concept”. Second, Alex wrote that although there were opportunities such as during the Q-and-A session when the authors could have brought the discussion home to contemporary Singapore, they did not do so and seemed evasive in their answers. One question which he felt needed to be raised but was not concerned the justification for the ISA. Alex wanted to ask the authors whether “a country can do away completely with detention without trial” and “whether a justifiable case remains for such a law (ISA), perhaps with more checks and balance, as a legitimate state response to violent extremists and terrorists. It is related to an age-old conundrum: Must a democratic state give free rein to those who would use that freedom to destroy democracy?” As always, Alex’s essay was thought-provoking and he had asked a tough question that those prone to sloganeering about democracy and human rights would side-step. I was not there at the book launch and I am not about to prove Alex’s reading of the event wrong. What I find thought-provoking is his reaction to the attempt by the detainees to communicate through their writing. I can imagine that many critically-minded Singaporeans who would demand more than crude denunciation of the ISA and charges of political incarceration would share his sense of disconnect. I can also imagine that outside of a small and receptive group, many of the detainees who understood their internment as a price they paid for their involvement in pan-Malayan politics would likewise feel a deep sense of alienation from a larger Singaporean public that now sees Malaysia as a jealous and often times, adversarial neighbour. To my mind, pronouncements of “no political significance” or doubts about their relevance would represent the ultimate shove of the political detainees into the dustbin of history, and yet they linger on, in flesh and in print, refusing to go away, not making persuasive sense, not empathetically understood. This suspended “meaningless-ness” of detainees in Singapore is to me symptomatic of a collective amnesia, one that renders former political prisoners inconsequential to Singapore’s past, present and future. Brandishing The Singapore Story as national history, the PAP is often accused of remembering history in a loaded manner. Less obvious are the amnesias The Singapore Story has generated, not so much as a consequence of the PAP’s deliberate suppression of counter-voices through sheer coercion or neglect but rather because the story’s overwhelming dominance has ensured mass dissemination of its logic and acceptance of the historical consciousness underpinning its narrative. Historical amnesias of this type cannot be compensated for by journalism-type exposes or revelation of fresh documentary material since they do not connote simple loss of memory or attempts to put the past away. They indicate, rather, a society’s failure to generate meaning from its engagement with the past and are central to― either a product of or constitutive of ―what literary scholar Philip Holden calls, the “historical commonsense”. A society’s historical commonsense is not something it can leave behind at will but is something like its interpretive matrix and nerve centre―crucial to the way it understands, projects, and perpetuates itself. To the extent that such amnesias are collective afflictions, they are not easily overcome by individuals being consciously critical or outrightly oppositional. Understood in a literal way as “a fact-based historical narrative”, The Singapore Story is amenable to good-old-fashion historiographical critique. It has its fair share of detractors after all. What confounds rational historiographical debate is the sub-conscious supplementary (a la Derrida) reliance of national history on counterfactual evocation ― the “what ifs” in history. As if a fact-based account solidly backed up with documentation alone is not enough, Singaporeans are constantly provoked to imagine what could have been otherwise. It is the “what ifs” that best capture Singapore’s historical commonsense. Counterfactual arguments release us from the burden of proof, allowing the imagination of infinite possibilities, even good ones. Their point of reference, however, remains tyrannically singular since what counterfactual arguments leave us with is a tangible sense of the inevitability of the present, understood through an authoritative account. Singapore and Malaysia inherited the ISA from late colonial Malayan Emergency regulations which justified draconian restrictions on democratic practices, free speech and human rights on precisely the need to protect these rights from “the Communists” who were out to banish them ― the familiar “White Terror” logic of counter-insurgency whose terrorizing effects that end up legitimizing detention without trial have yet to be fully recognized or studied in Singapore. Never mind that we would never really know what “the Communists” would really do in Singapore should they really take power for it is not the reality but the plausibility of this scenario that drives the logic of preventive detention. In the most patriarchal and colonialist version of this logic, fool-hardy non-Communists who sympathized with the Communist cause must be saved from themselves and Communist treachery. In a recent example of Singapore’s penchant for counterfactual historical phantoms, the title of one chapter in the non-partisan book, Men In White, asks “What if Barisan Had Won in 1963?” According to the “what if” logic of Singapore’s historical commonsense, Singapore would not have transformed into the perfect showcase of capitalistic development had those suspected of Communist sympathies (we now know that we don’t really need concrete proof of their “Communist” membership given its cell-like operations and the urgency of the Cold War situation) not been detained in the 1950s, 1960s and 1970s. It is in the realm of the “what ifs” that former political detainees now dwell, artifacts of Singapore’s historical commonsense. “Must a democratic state give free rein to those who would use that freedom to destroy democracy?” This question assumes a degree of universalism that is unabashedly insensitive to the historicity of the ISA in Malaysia and Singapore on several registers. First and most important, public acceptance of the ISA in Singapore is as much secured by the apparent overriding principle of protecting national security and freedoms as it is by our historical commonsense. In fact, I suggest that the legislation derives its legitimacy most from this than from it being an indubitable principle of the workings of a democratic state, hence our collective inability to connect even with those who no longer threaten. Over and above a colonial interpretation of “true democracy”, the abolition of preventive detention, in other words, was central to the Left’s concept of freedom and an independent nation. What is the significance of the haunting presence of former political detainees in Singapore? Like Alex and I suspect most Singaporeans, I do not doubt that there is need for legislation, with sufficient checks and balances that would be able to respond effectively to acts of violence perpetuated in the name of extremism. However, I do not think that acceptance of the need for such a law would thereby render any discussion about the ISA or the experiences of former detainees irrelevant. The ISA was not only instrumental in shaping the political landscape of late colonial Malaya and Singapore, it underwrote the formation of Malaysia and Singapore’s achievement of independence through merger with Malaya in 1963. I do not think, therefore, that justification for some version of the ISA should preclude recognition that it did not originate from a simple principle or function to protect national security, freedoms and democracy but was at the heart of some explosive and acrimonious debates, not at all “abstract” by any stretch of the imagination, about the very meaning of independent nationhood, freedoms and democracy that surely should be counted as part of Singapore’s history, pan-Malayan or not. In fact, if we accept the necessity of the ISA by flying the flag of national security and protection of freedoms and democracy, then acceptance of its necessity means the beginning and not the end of more awareness and openness about its existence, use and impact. See par 23 and 24 – the ‘Malaysian’ argument why ISA is still needed.